Revealing mistake: In the scene where Herbert and Dan re-animate the dead corpse, watch closely when Herbert rams the little buzz saw into the corpse's chest. At the bottom of the screen, you can see where the fake chest ends. Continuity mistake: When Cain and West are in the morgue trying to re-animate the cadaver, a phone rings outside at the security desk and when we see it, the buttons are facing outward, but when Megan goes down to the security desk, we see the phone is now turned completely around. Continuity mistake: The glass window in the door to Dr. Hill's office is broken so that the main character and his girlfriend can enter. Later when Dr. Hill and his severed head return, the glass is perfectly fine. 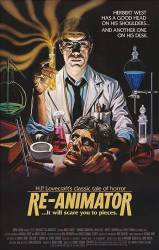 Trivia: Based only very loosely on the story "Herbert West: Reanimator" by H.P. Lovecraft, taking great liberties with the original story. This was, reportedly, one of Lovecraft's least favorite among his stories, one that he only wrote in order to "pay the bills." Trivia: The theme music of "Re-Animator" is a deliberate adaptation of the theme music from Alfred Hitchcock's 1960 movie, "Psycho," originally composed by Bernard Hermann. In the Millennium edition DVD of "Re-Animator," composer Richard Band said that his "Re-Animator" score is a tribute or homage to Bernard Hermann's "Psycho" score; this fact was supposed to be noted in the "Re-Animator" credits, but was accidentally omitted, leading to more than a little confusion and controversy among fans for decades. Swiss Woman Doctor: You killed him. Herbert West: I know your work, Dr. Hill. Quite well. Your theory on the location of the will in the brain is... interesting. Though derivative of Dr. Gruber's research in the early 70s. So derivative in fact in Europe it's considered plagiarized.